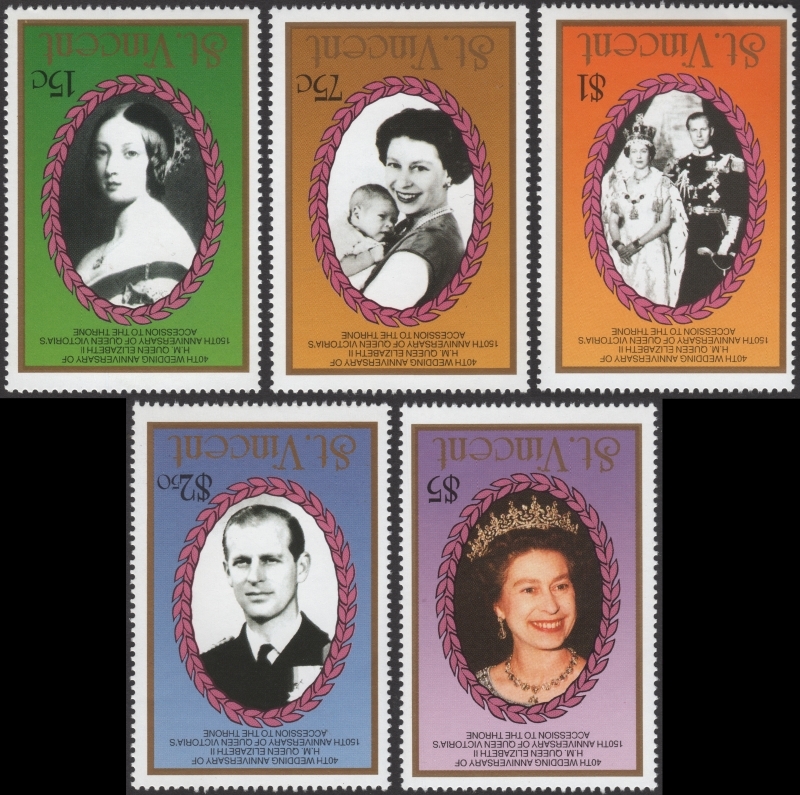 I have recently discovered that modern fake imperforate stamps and souvenir sheets including a new batch of inverted frames of this issue are being flooded onto the market. I can tell you that real dangerous	fakes or some call forgeries are being flooded on the market as I write this page in July of 2015. 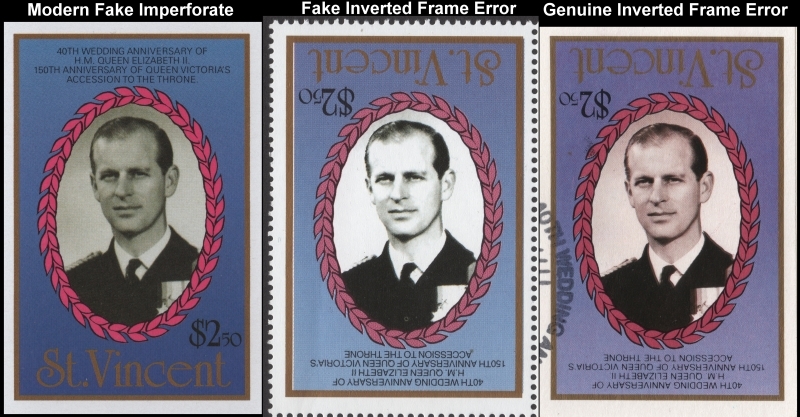 I have also finally found that the majority of inverted frame error stamps on the market are also fake reprints and forgeries. The unauthorized reprints are from a different printing that was not done by the Format International Security Printers. The forgeries are recently made. 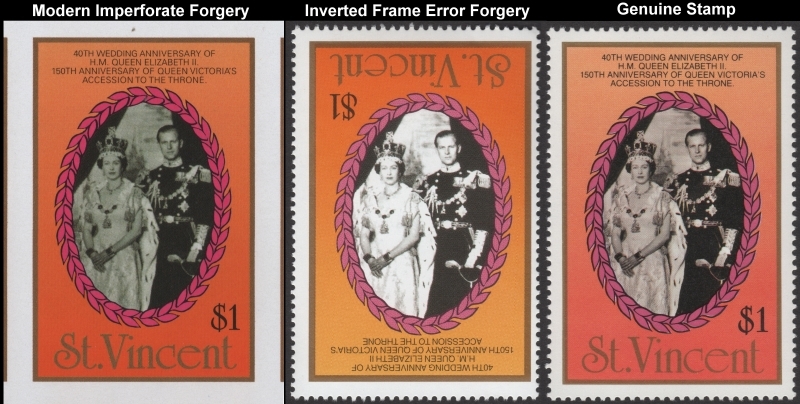 The original printing of the inverted frame "error" stamps was done for promotional reasons. Only the four low values were requested by Clive Feigenbaum and then printed with the error at the time. There was no request for the $5.00 value to be made as an invert according to the retained documents used in the trials against Clive Feigenbaum. The four values were to be made and used for promotions. As is the case with other issues the remainders were sold to dealers who in turn sold them to unknowing collectors and investors at overinflated prices. Many were conned by these dealers into paying up to $1500.00 for one inverted stamp! The inverts without authorization from St. Vincent were reprinted later after the Format International Security Printers went bankrupt and was liquidated at a different printing location and it was at that time that the $5.00 value was added. They have a yellowish gum type. 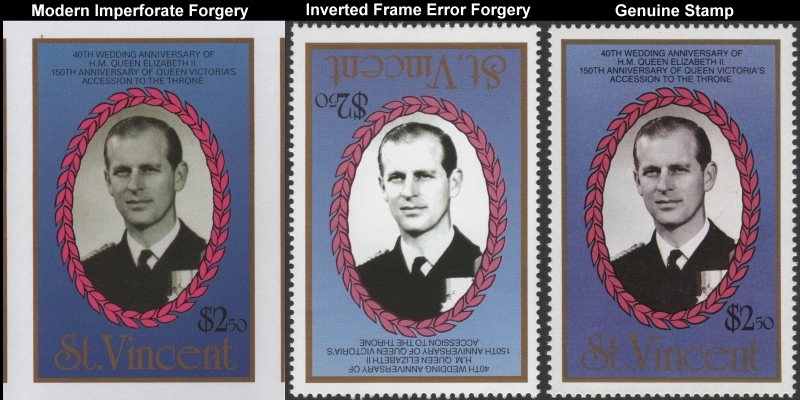 These new forgeries of the inverted frame "error" stamps as well as imperforate stamps and souvenir sheets and probably the normal perforated stamps are of an inferior quality as well and just like the Michael Jackson and Elvis Presley unauthorized reprints, are on a whiter paper only this time with slightly darker yellowish gum. They are all easily defined if you scan them at 1200 dpi or higher which reveals their screen differences. Please read on to understand all the new information. My research into the printer has enabled me to discover modern fake stamps have been created in 2014!! They are being spread across the world through online auction sites like ebay and Delcampe. Everything about them is fake except for one dangerous fact, they have the correct perf size. The gum type is different in it being white in color and very shiny. This gum type was not used until much later years, long after Format went bankrupt thus proving they were not produced by the Format International Security Printers. Obvious differences will be shown below. So far I have discovered fake perforated and imperforate stamps and souvenir sheets of the Saint Vincent 1987 40th Wedding Anniversary issue. They are being offered online right now as I write this on July 25, 2015. I have documented proof that 10,000 sets of imperforate forgeries were released onto the market in April 2015. The following list of sellers shows who is selling the inverts, the type of invert and I note also if the seller is overinflating the price as of September 2017. The lists are based on a maximum fair selling price of $10.00 for a set of five unauthorized reprints. In my book they should be priced at $2.00 or less for a set considering there are thousands of them out there and they are not genuine in any terms. $10.00 for a proven genuine set (one with no $5.00 value). This list shows you just how common the inverts are. Some of these sellers are holding a ton of them in their stock. I would therefore not buy any varieties of this issue unless proven to be from the genuine printing. These cons have ruined the market over decades now for this issue with their greed. As shown in the list, most of these sellers are pushing the unauthorized reprints. Now we have a ton of fake imperforates and who knows what else placed on the market. It is therefore your duty as a buyer to be diligent and not allow yourself to be ripped off. I do not buy nor sell this issue in any form. I have only done the research on it as all collectors and dealers should do. Because so many have not, the problems caused by a group of what I consider to be pigs starting with the creation of the inverts for this issue has destroyed the legitimate sales of genuine issues and varieties produced by the Format International security Printers in the 1980's as a whole! Any new sellers caught trying to off these inverts at overinflated prices will be added to the lists. The lists I make hit Google search very fast and the associated user name connects with my pages which rank at the top. Ultra-violet light section added September 24, 2017. 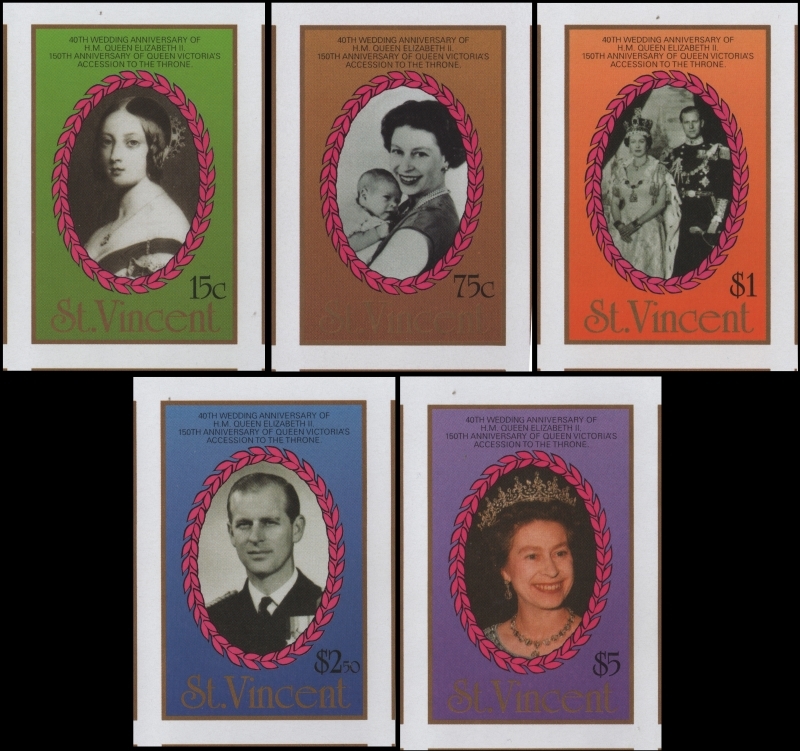 Recently I noticed sales of bulk lots of 5 on eBay of the Saint Vincent 1987 Royal Ruby Wedding of Queen Elizabeth imperforate souvenir sheet. They have and are being sold on ebay from sellers based in Latvia at the 99c start bid. The user names are armi777 and asrm10. Indeed they are the same related group of users. I note that the imperforate souvenir sheet has not been widely available until now. Rushstamps is the only dealer that has had any available in the past and I guarantee his are genuine. I purchased one of the eBay lots of these forgeries from asrm10 and found them to be from a completely different printing than the originals. The colors, screens, fonts and gum completely differ. 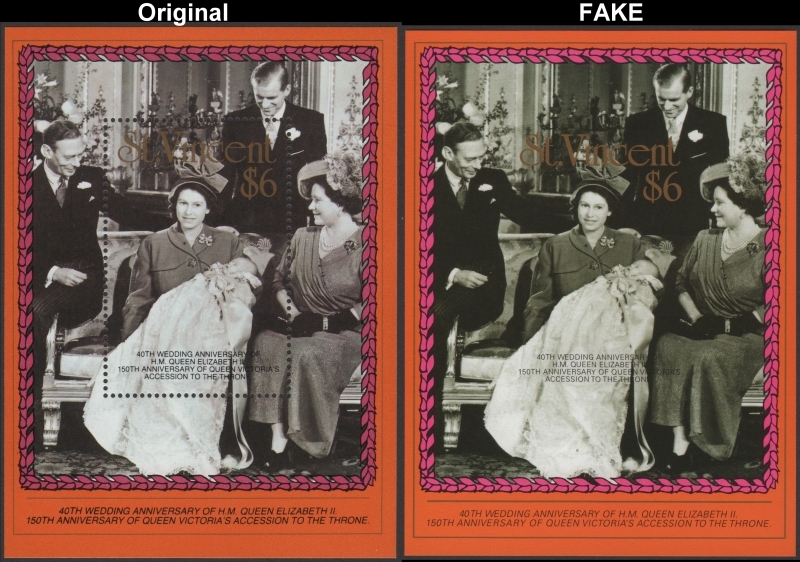 There are other issues from other countries being forged by the same source including inverted frame errors and imperforates and so yes, forgeries of the Saint Vincent 40th Wedding Anniversary stamp issues have surfaced as well. For this first section I am using a Saint Vincent imperforate souvenir sheet forgery and a genuine perforated souvenir sheet for comparisons. Here are the differences. 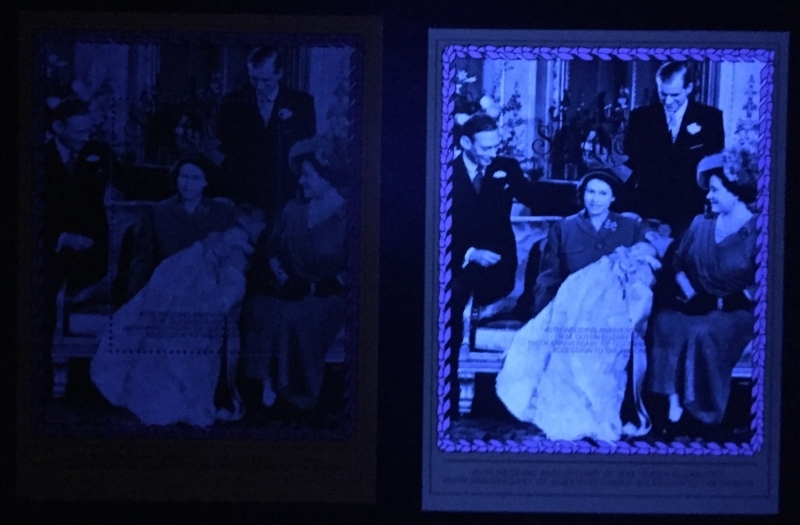 For the imperforate version of this issue that I have acquired the forgeries glow brightly as this image shows. There is an obvious difference in color and texture. Note the fake souvenir sheet is smaller than the original. 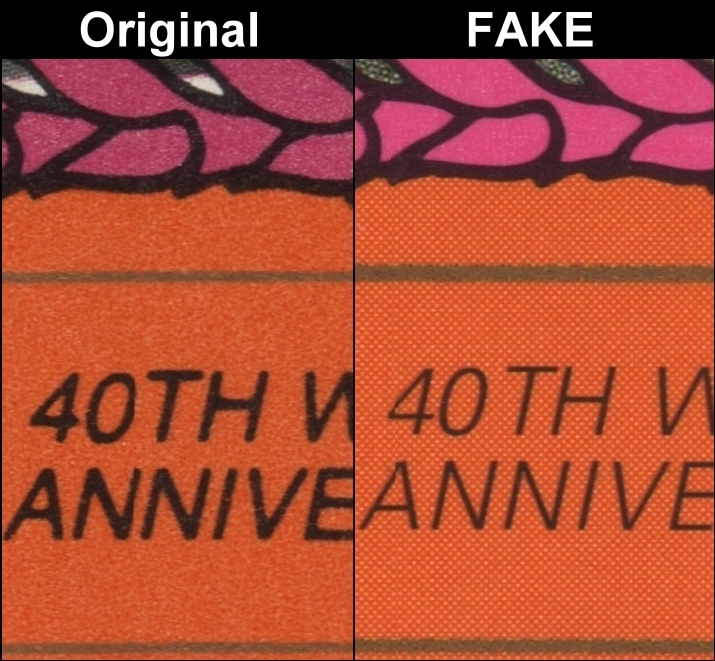 The color on the fake souvenir sheet picture image has a greenish tint overall while the original is a lavender tint. The inferior screen pattern is prominent making the image less detailed. Still a very dangerous forgery when not with an original to compare. The gold framelines are much thicker on the forgery. A crosshatch pattern is on the orange background of the forgery where it is solid on the originals. The fonts are much thicker and heavier on the originals than on the fakes. Here are the two souvenir sheets side by side. Now you can see the difference yes? Again please notice the forgery is slightly smaller in size. You can see that both the genuine invert stamp and the Feigenbaum reprint does not glow at all. I recently noticed sales of the stamps as imperforates being sold in bulk lots of 5 and 10 sets on eBay at the 99c start bid by the same Latvia based sellers. All still attached as in one side of a pane and so forth. I had to jump on those because up until now the imperforates were only being offered at high dollar amounts! I got a lot which was blocks of 10 for $12.00! Here is what I got. I found they had similar inferior screen patterns!! Well, I thought, this just cannot be. 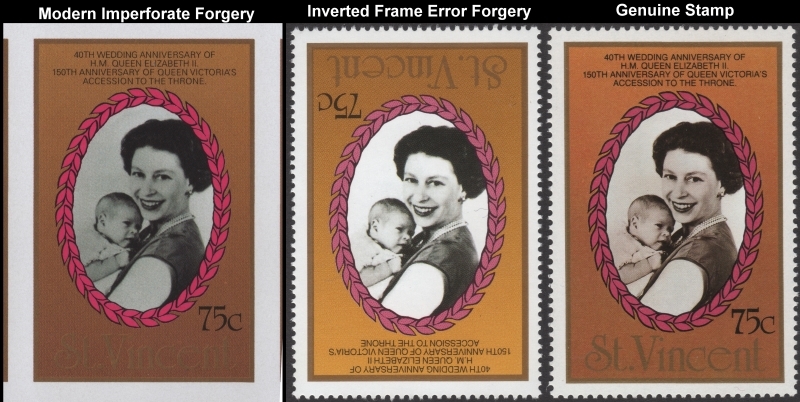 Why would the inverts I purchased in 2010 be similar to the forgeries being produced now? I looked deeper and could see both have inferior patterns but differ greatly in color and pattern and paper and gum type! Then it dawned on me. The inverts are not originals either! Off I go back into the stock and I get the promotional proof cards and sure enough a tremendous difference I find. The originals on the cards have the much finer screens used by the Format printers. The stamps are clear and beautiful and again completely different than the forgeries and what I can assure you are fake inverts now. So here is what to look for! I will use the $2.00 value for high resolution examples. The differences are in the same degree for all values. Here is an image of the three different printings side by side in reduced size. All three were scanned at 1200dpi at the same time so there is no difference in image quality. You can see they are quite different! Lets see part of the imperforate and the fake invert side by side at 1200 dpi! Note the imperforate is a much better fake than the invert. It indeed is very dangerous if viewed alone. Now let us view the fake imperforate with the genuine original invert from the card. Note the much finer screen used on the genuine stamp. 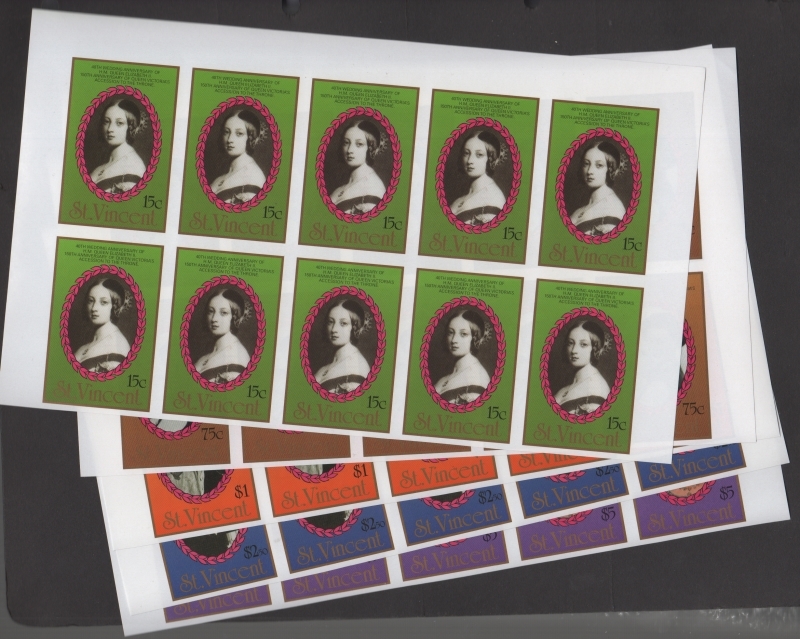 Note the fake imperforate has greenish tint on the image where the originals have a purple brown tint. Quite a difference yes? Now let us view the fake invert with the genuine original invert from the card. Incredible difference yes? Now you know what to look for in screen quality. Perforated, imperforate or error it does not matter. The differences are extreme. Let us look at fonts. You can see the fonts on the originals are much finer. You can see the fake imperforate border is closer in size to the original but the fake inverts have a much wider gold border. So now this all means you must be very wary in buying this set in any form thanks to the greed of some people. You can see the obvious difference of the fake invert. The image is mostly "whited out". 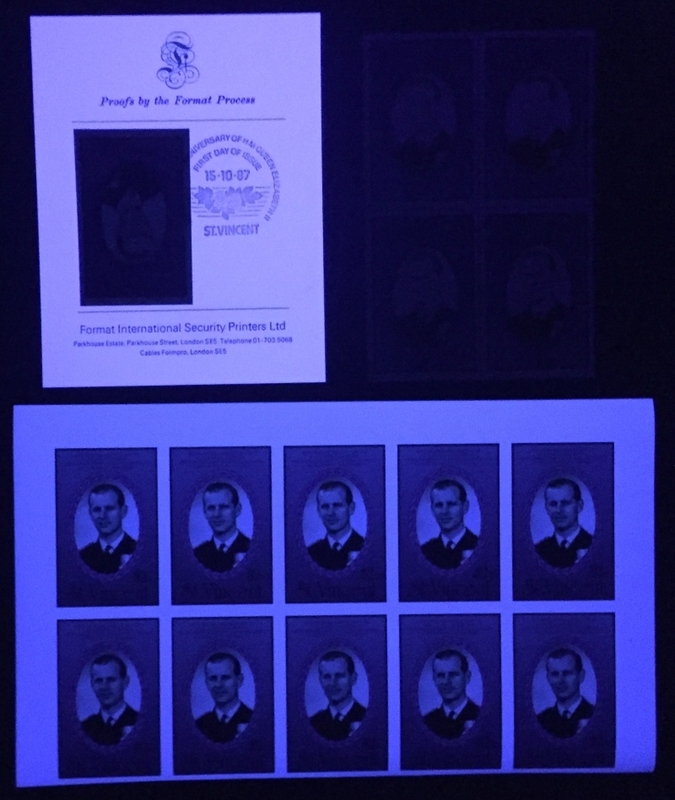 The imperforate forgery has brownish background compared to the genuine which is black background. 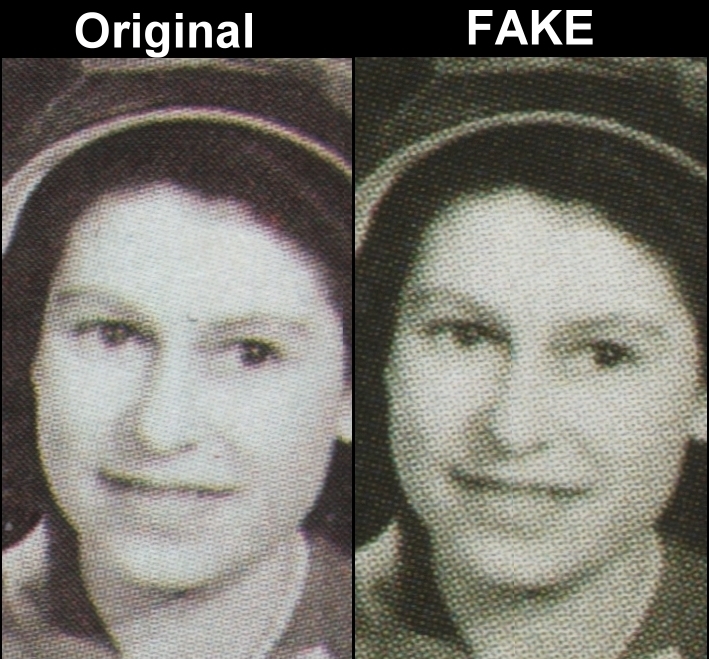 Again you can see the obvious difference of the fake invert. The image is mostly "whited out". The imperforate forgery has black background this time compared to the genuine which is a reddish-brown background. Again you can see the obvious difference of the fake invert. The image is mostly "whited out". 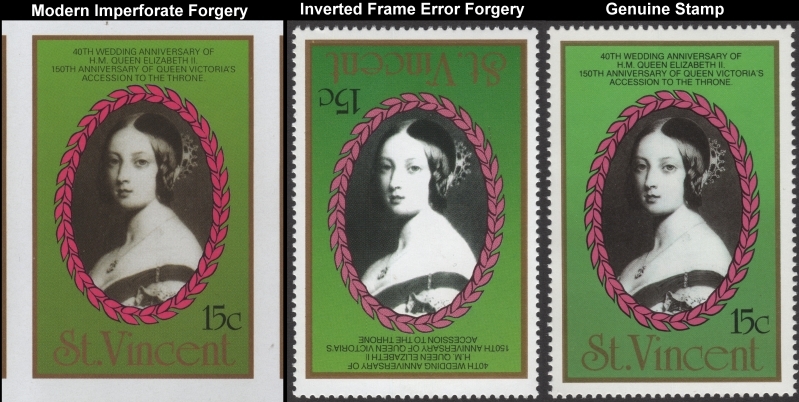 The imperforate forgery has greenish-black background this time compared to the genuine which is a reddish-brown background. You can see the obvious difference of the fake invert. The image is much lighter as is the lavender background. The imperforate forgery has solid lavender background compared to the genuine which has a lighter lavender at the top of the background flowing into a darker shade of lavender at the bottom of the background. Now for a final piece of evidence proving these fake inverts were never produced by the Format Printers. See the color guide I have placed a red circle around? The Format Printers never used anything like it. This type of color guide has been found on unauthorized reprints of the St. Vincent 1985 Michael Jackson and Elvis Presley issues. Those being reproduced by Clive Feigenbaum in the mid 1990's after the Format Printers were long since out of business. The guide which cannot be found on genuine panes is absolute proof the majority of the inverts are not genuine. The seller on eBay selling this set is asking $50.00! Pretty cheap considering some singles have been sold over the years for up to $1500.00! Ahhhh....but this shows you how common the reproduced inverts are. This seller has been selling these pane sets numerous times. 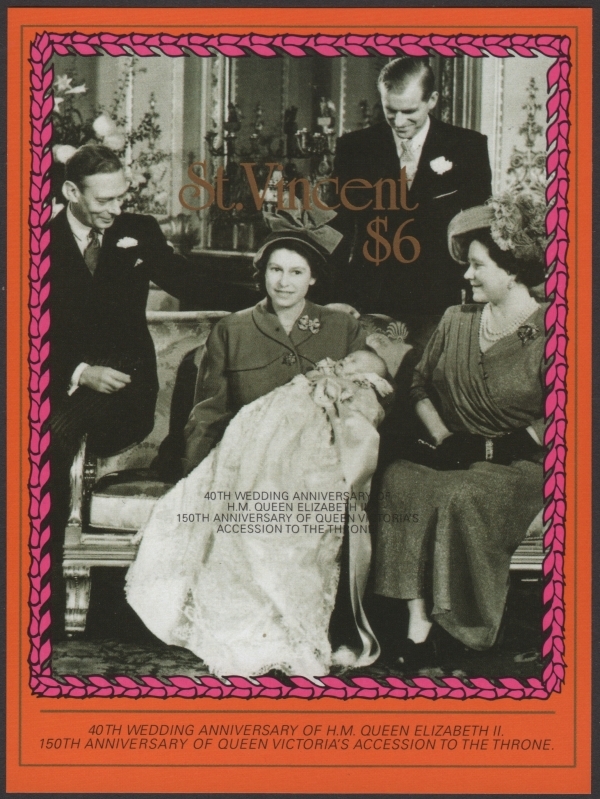 You can now define the fake Saint Vincent 1987 40th Wedding Anniversary of Queen Elizabeth II souvenir sheet and royal family portraits stamps easily and can now possibly avoid being ripped off! 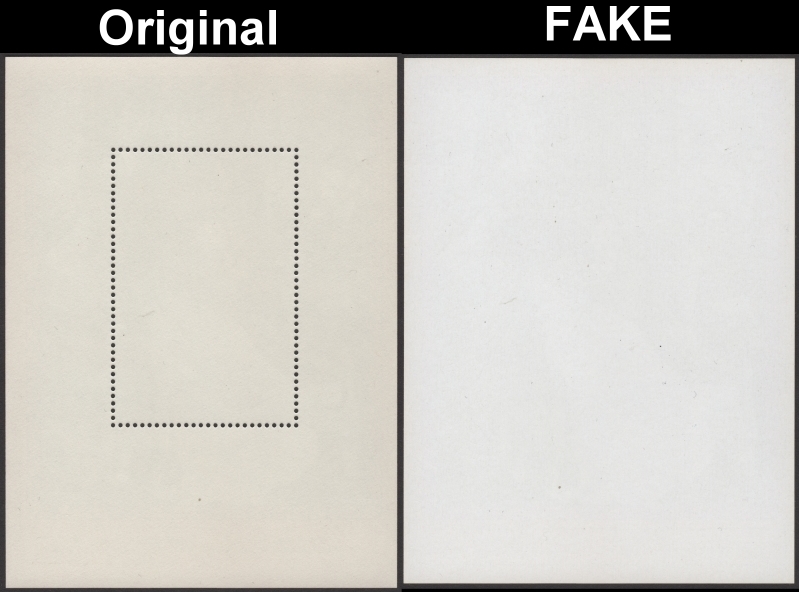 Here is a link to an image of the original souvenir sheet next to a fake. Scanned at 600dpi so the file is large. Both souvenir sheets were scanned at the same time with the same settings and nothing is enhanced. Please be patient with downloading the file because it is around 7 to 8 megs.